Kratophany - ZineWiki - the history and culture of zines, independent media and the small press. Kratophany was a science fiction zine by Eli Cohen. 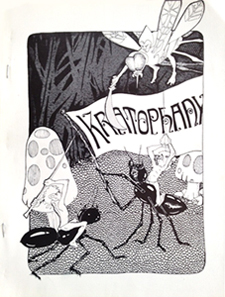 The first issue of Kratophany appeared in November 1971. The first few issues were published in New York City, NY, U.S.A. Then Eli Cohen moved to Regina, Saskatchewan, Canada, and then again to Vancounver, British Columbia, where subsequent issues came out. In 1980 he returned to New York to publish issue 13 in 1981, which would be the final issue after a decade of publishing. Contributions included columns by Ginjer Buchanan and Janet Kagan (Akos). Other contributors of writing included David Emerson, Jon Singer, Angus Taylor, and Susan Wood (Aspidistra, Amor). Also included was an illustrated serial called "Wendy and the Yellow King" by Judy Mitchell and Mike Mason. Cover art was contributed by Judy Mitchell (#1, #10), Steve Stiles (#3), Randy Bathurst (#6), and Vincent Di Fate, with additional illustrations by Ken Fletcher (Rune), Alexis Gilliland, and Jeanne Gomoll (Janus). Eli Cohen had previously been co-editor, with Janet Kagan, of Akos from 1969 to 1970. He also did the APAzine (for CRAPA) Moss on the North Side in the late 1970s.